A second PSF-DALILINK can be wired in parallel to provide an additional 100 mA bus power (for 200 mA total). Do not connect more than two PSF-DALILINK, or a PSF-DALILINK with a different DALI bus power supply, to a single DALI bus. This could result in permanent damage to the connected RATIO and DALI devices. Miniature case size accommodates limited fixture channel space and small enclosures. Terminals accept a wide range of wire gauges. 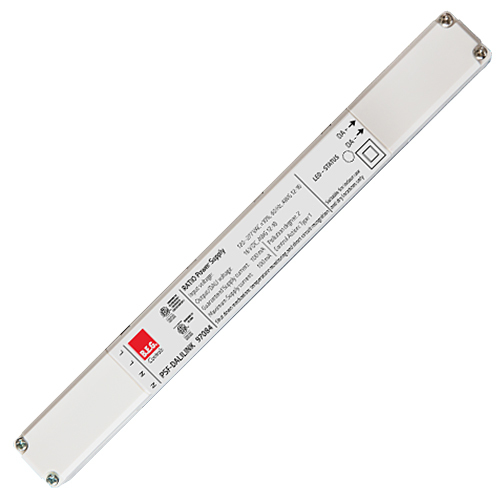 Line voltage terminals accept 12-20 AWG, low voltage DALI terminals accept 16-24 AWG. Solid copper wire recommended.